One of the most exciting applications of 3D printing is in medicine. Conventional 3D printing is playing an increasingly important role in our hospitals and health providers.Medical researchers have already printed artificial bones, tailor made for people based on scans of their real bones and then implanted to replace bones that have been removed or damaged. For example, existing 3D printers are capable of producing personalised hip replacements, with the ball permanently inside the socket, and even at current printing resolutions the unit will not require polishing. Many leading biotechnology firms are currently exploring the applications for 3D Printing in the field of tissue engineering. Organs and body parts can be constructed artificially using inkjet techniques. Layers of living cells can be printed onto a gel medium and slowly built up to form three dimensional structures. 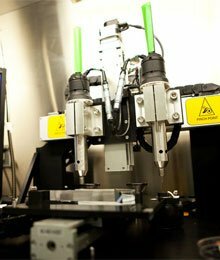 This area of research is referred to as Organ printing, Bio-printing, or Computer-aided Tissue Engineering, along with other terms.Printers 3D. Scientists from the Fraunhofer Institute in Germany used 3D printing and a technique called multiphoton polymerisation to create artificial blood vessels. They combined 3D printing technology with two-photon polymerization, using laser beams to stimulate the molecules in a very small focus point. The resulting elastic solid material can function as capillaries for artificial organs. One big advantage of this approach is that the body will not reject them as they are artificial, so they need not be coated with biomolecules.